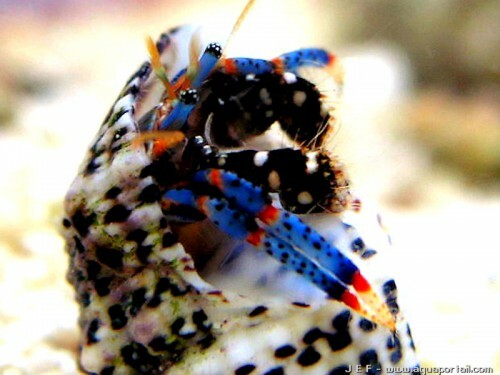 Common name: Blue-legged hermit crab, tricolor hermit crab, blueleg reef hermit crab, equal handed hermit crab, blueleg hermit crab. Small hermit crab, peaceful and quiet. Because of its small size it is also suitable for very small tanks. It needs a tank with live rocks and plenty of hiding places. Vegetarian, eats food residue from the other animals, special food pellets for Crustaceans, green algae and filamentous algae. It 'a very efficient algae eater and it is sometimes used to limit the proliferation of algae. Being very peaceful if they can introduce an individual every 15-20 liters of water, however, to avoid competition during the molt is necessary to enter 2 or 3 shells of suitable shape and size for each individual. It can not be kept with fish of medium-large size or predators. It does not cause problems with other invertebrates. Reproduction in the aquarium is not possible, since the larvae are planktonic.